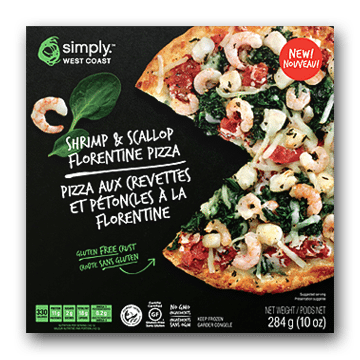 Featuring sustainable seafood harvested at the peak of freshness, this traditional thin crust pizza is loaded with plump scallops, tender shrimp, fresh spinach and delicate roasted garlic. Viva Italia! 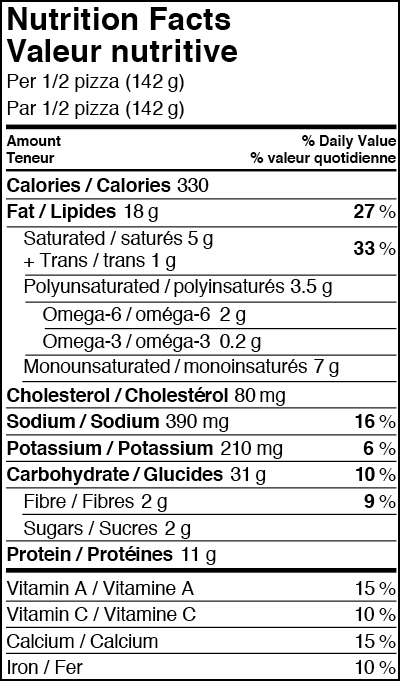 Gluten Free Crust (Rice Flour, Corn Starch, Liquid Whole Egg, Water, Non-GMO Canola Oil, Baking Powder, Sugar, Salt, Tapioca Dextrin, Yeast, Guar Gum, Xanthan Gum, Sodium Alginate), Mozzarella Cheese (Pasteurized Whole Milk, Bacterial Culture, Salt, Microbial Enzymes), Tomatoes (Tomatoes, Tomato Juice, Basil), Spinach, Wild Shrimp, Pacific Scallops, Roasted Garlic Spread (Garlic, Olive Oil), Fresh Basil, Olive Oil. Cook from frozen. Do not thaw pizza before cooking. CONVENTIONAL OVEN: Preheat oven to 400°F (200 °C). CONVECTION OR TOASTER OVEN: Preheat oven to 350°F (180 °C). Remove plastic wrap and place frozen pizza directly on middle oven rack. Bake pizza for 10-12 minutes, or until edges are to desired crispness.